Made these. Just came out of the oven, I have a picture but nowhere to post. They look good. I ended up baking mine for 15/18 minutes. I also added a cinnamon sugar mix to mine. I would have followed the 2tbs mounds but I wanted a nice amount of cookies. So I used a little less than 1 tbs and it still only gave me a dozen. Not very sweet by any means. Very moist, dense, like airy. I think that’s the proper term. All in all I would say not too bad for a quick recipe. Just wish the dough was sweeter and more. I found that this recipe was not very sweet. Although they tasted okay, it was lacking the overall cookie taste to me. I also added half a teaspoon of baking soda and powder and they came out very fluffy which I preferred. Hi Kara! These are meant to be “in a pinch” cookies for people with few ingredients on hand and needing cookies quickly. If you want cookies with more flavor I would suggest trying out my best chocolate chip cookie recipe or my soft and chewy cookie recipe! Very simple to make and so good. We didn’t have any left. So glad to hear you enjoyed them Georgia! DELICIOUS!!! I babysit three toddlers and they get fussy quick. One day, the oldest (5) asked for cookies so, to keep down the fussing, I searched for an easy recipe and this one was perfect. I recommend it for any quick cookie crisis. Thanks so much, Dee Dee! Glad you enjoyed it! Perfect for what it is. I used butter with canola oil added because that’s all I had on hand. This is possibly my first time ever making cookies from scratch, and my husband and I both think they turned out good. My new go to cookie recipe! I used self- rising flour instead of all-purpose flour and omitted the salt. Super moist cookies!! Hi Sofia! Oil is not a good substitute for solid fat in baking. The recipe states you can use salted or unsalted butter for this recipe. So if you all you have is salted you can use that and you do not need to add the pinch of salt into the recipe. Just wanted you to know – I’ve had this recipe saved for about four years – and I STILL use it time and time again! Such a great recipe!!! These were great!! This recipe shows up for a google keyword “self-rising flour cookies”, so I made them with self-rising flour without thinking. They came out wonderfully – nice consistency, fluffy, with really good flavor. Thank you!! That’s so great to hear Mia! So glad you enjoyed them! Oh dear, John! It looks like there was not enough flour in your dough. Was the dough very wet? Also possible that your oven was not cooking hot enough so all the butter melted before the cookies could set. Do you by chance have an oven thermometer in your oven? That makes me so happy Ashley! Thanks for sharing your picture! The look great! Very yummy but only made 10 cookies. If I’m putting in effort to bake it’s nice to have a bit more of a result. Hi Rosie! Make sure you are creaming your butter and sugar together well until light and fluffy. This actually increases the volume of the dough. This recipe is also easy to double if you want more cookies. Glad you enjoyed them! I am looking for eggless gluten free cookies which I made by incorporating coconut flour , sorghum flour and corn flour and I also used honey instead of sugar so can you tell me the correct ratio of flours. Does using honey instead of sugar taste good?? Hi there! I’m sorry but this style of baking isn’t really my expertise. I really focus more on traditional baking so I’m not really sure what ratios you should use. You can use honey instead of sugar if you like in baking, but it definitely changes the texture! I made these yesterday they were easy and delish. These are our new favorite cookie. They are so quick and easy with minimal ingredients that it is not a huge ordeal to make . Love them- thank you for sharing. I’m so happy to hear that you enjoy these cookies Olivia! I have been making these for several years. They used to be 5 ingredient ones :). They taste great and I havent seen the need for a more complicated recipe. The prep and cook time is however not correct. Overall, 30-35 min at least. Probably abit more till you can eat them. So surprised this recipe didn’t have any soda in it.First time baking this and they’re better not too sweet opposed to,too sweet! So glad you enjoyed them Viola! I’m so glad to hear that you enjoyed these cookies Aaron! These came out great! I didn’t have any vanilla or chocolate chips so I improvised with 1tsp bourbon and chopped up leftover Halloween candy (Hershey’s chocolate and Reece’s pieces) . Definitely a good cookie to make with minimal ingredients. Glad you enjoyed them Nicole! 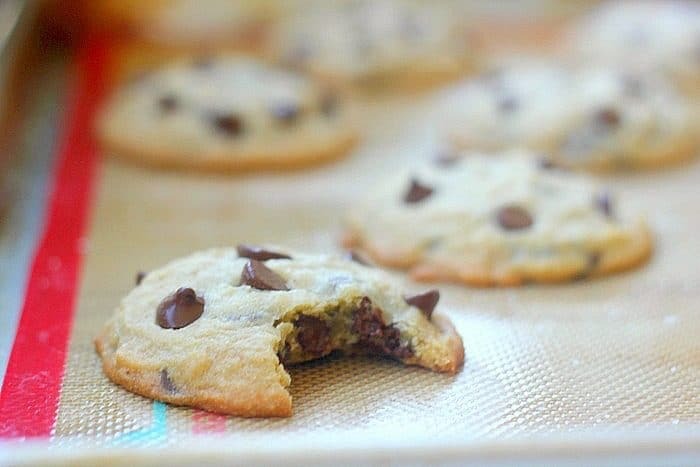 These are my favorite chocolate chip cookies to make! Do they freeze well? they came out pretty good, although i think they could use more flavor. it could be because i used milk chocolate chips. also wondering if i could add Hershey chocolate baking powder to up the chocolate flavor. if so, how much? i topped mine with a simple chocolate frosting (powdered sugar, butter, milk, vanilla, Hershey powder) which brought them over the top. Thanks for this! Loved the recipe. My 6 year old baked the cookies with some guidance yesterday. They came out really well . Thank you. Quick question: My cookies were a little thin and not fluffy. They tasted great though and I kinda prefer the thinner version. Should I add baking powder next term if I want a more fluffier version, or any other ingredient? That’s so great to hear! If you want them to be fluffier, then adding the baking powder will definitely help that! That is what I would suggest. I would use 1/2 tsp for this amount of dough. They were terrible! Taste more like flour then anything else. Very disappointing!! Hi Mel! So sorry to hear you didn’t enjoy these cookies. Since this is a tested recipe made many times with success, I would love to help you troubleshoot! The way you describe the cookies makes me believe that you may have ended up with too much flour in your dough. Make sure that when you measure your flour you fluff it up with your spoon, lightly spoon it into the measuring cups without packing it down at all, and then level it off. I cannot cook to save my life – but these turned out oh so perfectly! I didn’t have any chocolate chips – so I used cacao powder and maple syrup. Sprinkled with sea salt before I popped them in the oven. They turned out delicious! Very addictive. Beautiful! I’m not much of a baker but I made these with my 7 year old daughter, she thought they were so good she has been raving about them to everyone and now wants us to open a cookie store. That’s so great to hear Megan! Can this dough be either frozen or kept for sometime in the fridge? I’d love to have a batch on hand at most times. Hi Ann, yes you can do that. I would suggest that you go ahead and scoop them into cookie dough balls and store that in the fridge or freezer. 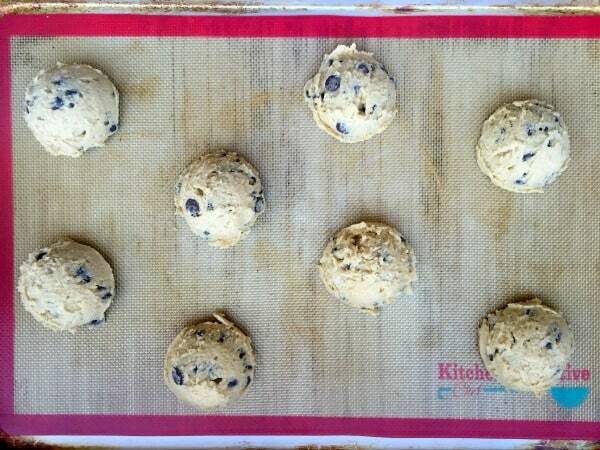 You can store the raw dough in the fridge for up to 3 days and in the freezer for up to 3 months. Increase the baking time, just keep an eye on them. Can you use gluten free flour with this recipe? I would recommend substituting a gluten free blend like Bob’s Red Mill’s gluten free baking flour or cup4cup flour. Super easy, super good! My 3 year old grandson and I made these today. I added 1/2 cup milk chocolate chips and 1/2 cup of caramel chips. We will make these again and again! I’m so glad to hear that you and your grandson enjoyed them! I love the idea of using caramel chips! Sounds delicious!